I have a 24mm Soligor 2.8 FD mount. Everything works on it but I can't turn the focus to infinity, it jams at 0.7m, but can be turned the other way all the way to 1:4 macro. I can't seem to figure out what is stopping it from turning any further, does anybody have any ideas or advice? There are other youtube videos on how to fix or modify vintage lenses. It's possible someone might be able to help you out. Also, try posting on multiple forums (you might've already done this) and see if anyone has suggestions. I hope this helps. If you have any questions on what I said, please let me know. Please keep Magic Lantern posted on your situation. Does it have a adapter with correction lenses? FD mount, IIRC, needs a correction element between the sensor and the lens, to make it focus in the infinity. There's not much for option in terms of camera shops where I am in Australia. I'll check out the youtuber. I don't mean the focus in the camera, I mean the actual physical focus on the lens, it won't twist to the infinity state. 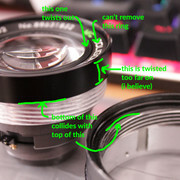 The focusing is basically a giant screw, disconnecting the lens the twisty part can still click from end to end, macro to infinity, but the lens part won't physically screw all the way to infinity. Have you disassembled it in two parts? Looks like it. What you have inside of the screw helicoid now is multiple thread i.e. there is more then one way to screw the lens part in. So just draw some marks and check all the possible combinations. But there may be a kind of thumb (like that http://album.foto.ru/photo/2921784/ - possibly skewed) and parts of aperture control, which prevent the lens block from screwing in to the end. It's just a guess, I've never saw your lens. I should get some pictures up. I did fix the problem I made, it's not back to its original state of only getting to 0.7m. I have pulled those things picture out which is what syncs the screw focus to the end point ring that just twists back and forth. The thing that just twitst back and forth is fine. I the the problem is, somehow, the top of the lens is screwed too far on, so that ring stops it from twisting further because it collides with the base below it. The problem I'm having now is I both cant get it off, or the ring inside it which has all the lens specs on it. When I try to undo that the front lens element unscrews instead. Didn't know there was now any image upload button. ..The problem I'm having now is I both cant get it off, or the ring inside it which has all the lens specs on it. When I try to undo that the front lens element unscrews instead. Getting traction on lens elements and retaining rings can be a pain. I have used rubber sewing thimbles or even rubber coated gloves with moderate downward pressure. This should give you enough grip to unscrew the ring unless it is glued. “this one twists out” – it locks the front lens. Leave it as it was. Try to avoid sliding and rotating the front lens. Some people use fridge or smartphone vibration to settle the lens down, then tighten collar. Don’t use any force. If you get terrible lack of sharpness – it means the front element is a bit off. The branded collar and the filter thread should be one piece, I can’t believe you ever rotated them separately (I can be absolutely wrong, naturally). But this part does nothing about focusing. “bottom of this collides with the top of this” – yes, at this position the lens is focused to the infinity or even behind it. So now you have 6 (or something alike) variants to screw these parts together. Screw it in to the end, screw a bit back as you need to set the synching thumb to its place (on the photo). Then check the focus with the camera (don’t rotate the ring while mounting, just check whether it’s infinity or not). When you find the lucky position and focusing works from end to the end – it’s time to look at the distance scale. Does it show the wrong numbers? If so, find some small screws in it, release them. Rotate the scale to the correct position and fix it. If so, you are done. I don't think it's glued because i feel like I twisted it on at one point just with my fingers when it was loose. However I have tried a latex mat and also a rubber oring, but I think the thimbles sound like a better idea. So the bottom that collides with the top does not happen at infinity is the problem. It happens at 0.7m, I have to screw it off somehow, unsure how, maybe it's locked on with screws behind the trim ring. I can untwist that middle ring and remove the first element at the front, it is not attached to the trim ring. I won't need to customize the focus because there's a separate ring that defines the start and end point. However I can't reach the end point (the infinity point) because of that collision. Sorry to bother. Please clarify: is 0.7m a number which you read on the scale, or you have measured actual distance with you film camera (or the proper DSLR adapter)? Or just both? 0.7m is the number on the scale, I haven't measured specifically with the camera but it is certainly close to that. So... You are right. Continue with pulling and rotating. What's the status of your lens? Any luck? I hope it's possible to fix on your own. Was just about to put an update here that I am out of ideas for getting that ring out, I can't get a good grip on it. I even made my own silicon ring to the right size and couldn't get it. I'm not sure if that outside ring can turn or not or if it's screwed in place. I'm theorizing that the inside ring got tightened, then the outside one which basically acted like a second nut, locking them both or at least the inside ring in place. That's if the outside ring can be unscrewed off without undoing screws under that cover ring with the writing on it. Still not sure how to get either of them off. Sorry you're having so much trouble! The only other suggestion I have is to contact more people on Youtube who have vintage lens videos. I'm going to bump this in case there's somebody new who can scroll through and look at the pics and make a good suggestion. Wow 120 days this lens has being sitting dismantled on my table. It's gotten quite dirty lol. Page created in 0.047 seconds with 17 queries.